Many people say that a hot dog and a sausage are one and the same. Do you think so, too? If you don’t, you are not alone. In fact, whether they are the same or different has been a hot topic in web forums and household conversations for a long time. Hopefully, we’ll be able to put an end to that through this article. A hot dog (or hotdog) is a kind of sausage popularized in the United States. It is a combination of meat trimmings, fat, seasonings (salt, pepper, and garlic), and preservatives. The meat used can be beef or pork, or a combination of both. Several brands also produce hot dogs made with chicken, turkey, or plant substitutes like soy and wheat. Hot dogs are to be eaten sparingly of the high amount of fat, sodium, and nitrites used during the process. A sausage is made from a combination of meat, fat, salt, seasonings, preservatives, and fillers. The mixture is then injected into a casing traditionally made from cleaned animal intestines. Nowadays, however, some brands use sausage casing that is made of artificially constructed collagen. 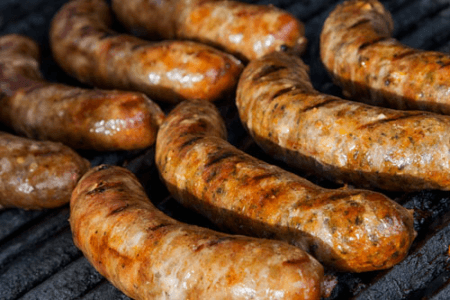 Commercially sold sausages may be cured, dried, smoked, or they may have undergone a combination of the said processes. The type of meat used in making sausages can be veal, turkey, chicken, beef, pork, or any combination of these. Many brands have also ventured into vegetarian and seafood sausages. Sausages can be cooked by frying, broiling, and grilling. The casing, or “skin,” may or may not be removed depending on the brand. What, then, is the difference between a hot dog and a sausage? A hot dog is a kind of sausage, while a sausage is a generic term that describes any combination of meat, seasonings, fat, preservatives, and fillers, injected into a cylindrical casing. 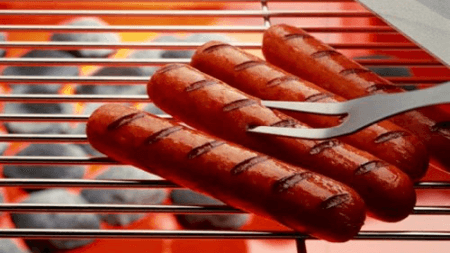 Most of the time, hot dogs are eaten without the skin, whereas sausages can be eaten with or without the skin (depending on the brand). Hot dogs were originally popularized in the United States and are a huge part of the American culture. On the other hand, sausages originated in Europe.